where z is the longitudinal position, Ndop is the doping concentration of laser-active ions in the fiber core and ξ(λ) is an overlap factor, taking into account that part of the light propagates outside the core and thus does not “see” the doping. Note the term with negative sign, taking into account reabsorption of the signal. The reabsorption effect will be particularly important at locations where the excitation density is low; the net gain can then even become negative. Even in the strongly excited parts of a fiber amplifier, it is often quite relevant. We can apply the same kind of equation for the pump wave. There, the gain will come out negative as the absorption term is dominant – the pump wave is attenuated by absorption. The equation above is somewhat simplified, assuming a constant pump intensity within the core for a given z position. To generalize that, one would have to insert an integration over the area of the doped region. Such a version would allow for arbitrary transverse variations of field intensities and doping concentration. Suitable simulation software takes such things into account. One may also insert a negative addition to the equation above in order to take into account parasitic propagation losses of the fibers. These are usually quite weak, however, in the small length of an amplifier. A nice aspect is that if the fiber is single-mode, the spatial distributions of pump and signal light are fixed except for the longitudinal evolution of powers due to absorption, gain and possible parasitic power losses. So we only need to calculate how the optical powers evolve, and often do not have to do full-blown numerical beam propagation (with wavefronts, etc.). Even in multimode fibers, one often gets around that. As an example, consider an erbium-doped phosphate glass. 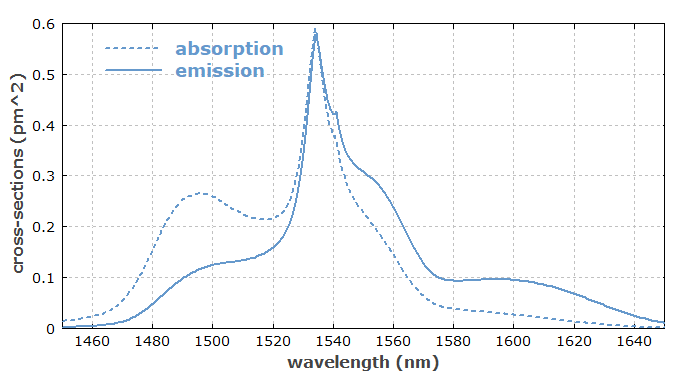 Figure 1 shows its effective transition cross sections in the 1.5-μm spectral region. 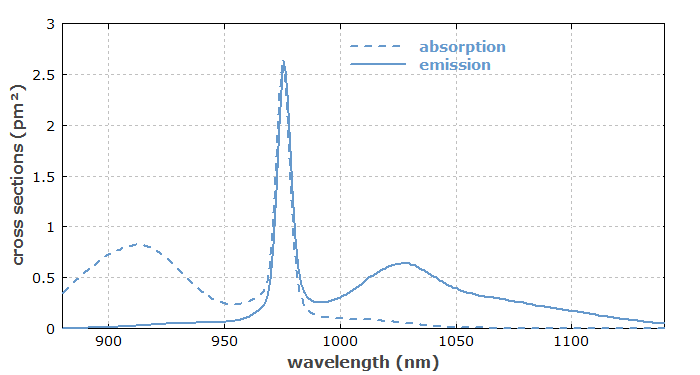 Figure 1: Absorption and emission cross sections for erbium ions in an Er:Yb-doped phosphate glass, with data from S. Konkanen et al., Proc. SPIE 2996, 32 (1997). Figure 2: Effective gain from the data in Figure 1, with a degree of excitation from 0 to 100% in steps of 10%. For the ground state (lowest curve), we have absorption (negative gain) at all wavelengths. With 50% excitation of the erbium ions (middle curve), we get some gain in the 1550-nm region, whereas there is still net absorption at 1500 nm, for example; however, that absorption is now much weaker than for the ground state. With 80% excitation, the net gain in the 1550-nm region and particularly around 1535 nm gets quite high, and there is now also some gain even at 1500 nm. This implies that such a high excitation level is not possible with 1500-nm pumping; it requires a shorter pump wavelength in order to reduce stimulated emission by the pump wave. 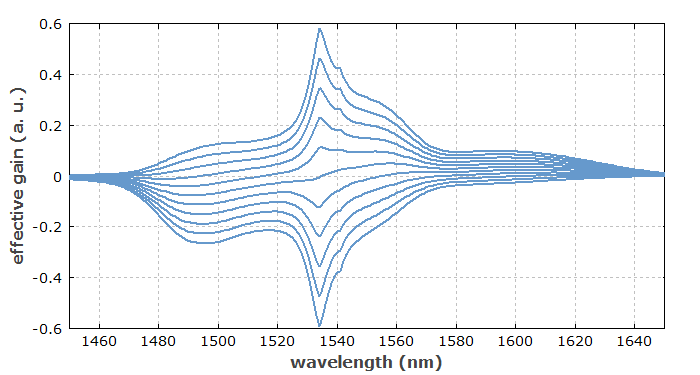 It is practically only possible with pumping into level manifold 3 (4I11/2) with a wavelength around 980 nm. Unfortunately, the power efficiency of pumping is then worse due to the high quantum defect. Figure 2 shows that stronger excitation levels do not only provide more gain, but also change the shape of the gain spectrum. This is a typical phenomenon for fiber amplifiers. Figure 4: Effective gain from the data in Figure 3, with a degree of excitation from 0 to 100% in steps of 10%. For little ytterbium excitation, we first get gain in the long-wavelength region. If it increases further, we get gain also in the 1030-nm region, where it can get much stronger. Only when ≈50% is reached, the strong absorption at 975 nm is saturated, and above that we get a strong gain there. This means that for high pump intensities at 975 nm, the excitation becomes ≈50%. Strong absorption and stimulated emission of about the same strength compensate each other. At short wavelengths like 920 nm, there is hardly any stimulated emission, so that pump light can be absorbed for even more than 90% excitation. 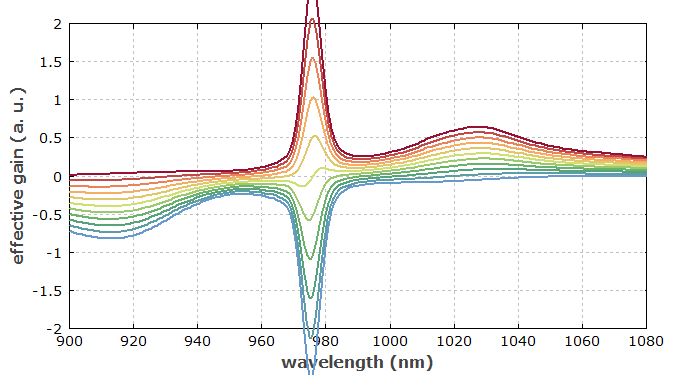 In both cases – erbium and ytterbium – we observed a pronounced quasi-three-level behavior, particularly for short signal wavelengths: without pumping, the fiber provides losses (i.e., negative gain) due to reabsorption of signal light, and only above some value of pump power one can obtain positive gain. (For longer signal wavelengths, the reabsorption effects gets weaker.) That behavior is typical for fiber amplifiers, as most of them operate on such transitions where the lower laser level is the ground state manifold, or more precisely the higher-lying sublevels of it. A notable exception are neodymium-doped amplifiers operating on a four-level transition in the 1050-nm or 1.3-μm region. These do not exhibit signal reabsorption (only rather low parasitic losses) and can provide some positive gain already for very low pump power levels. So far, we discussed only the local gain in the fiber. The overall gain of a fiber amplifier is treated in the next part. Go to Part 3: Self-consistent Steady-state Solutions or back to the start page.